Naughty or Nice? Why Not Both! Thala pushed back with all her might against the gnoll berserker, but the gnome rogue might as well have thrown herself against a wall made of dragons. She would end up in the bottom of the magic-tinged purple river behind her. The mage was unsure of the spells within the water, but the resident monsters were trying to push her and her companions into it, so a bath would probably not be pleasant. “Whatever it is, it’s better than being devoured by gnolls,” she thought as she fell backwards into the icy embrace. Hagus would not be outdone by his little friend. The elf fighter grinned as he dove head first into the water… and promptly turned into a pig. The earlier examples involve a stream that can make a person fly or polymorphs them into a pig at random, but there’s tons of fun examples out there. In this post I’d like to discuss the types of risk/reward environmental effects I use most often and provide some examples. Hopefully it’ll spawn some ideas for you to use in your own games and give you some crunchy pieces to steal. These environmental effects are both naughty and nice! One of the simplest ways to create a risk/reward environmental effect is to assign a save DC to its effects. If a save is successful, the character gets a boon. If the save is a failure, the character is harmed in some way. The characters enter a room with a fountain statue of a vampire spewing blood in 10-foot-radius blood pool. Any other creature that drinks from, enters, or starts its turn in the blood pool must succeed on a DC 17 Constitution saving throw. Creatures who fail gain one level of exhaustion. Creatures who succeed gain 20 temporary hit points. You can even assign levels of success and failure to an effect. Maybe if a creature fails the save by 5 or more, they suffer two levels of exhaustion and if they exceed the save DC by 5 or more they get an extra 20 temporary hit points. These types of hazards are perfect for a simple, binary result, but be aware this is an easier system to game. In the example above characters with high Constitution scores may decide a little dip is worth the risk while others may avoid it once you call for that particular save. If you want to see you players struggle with the choice like, “Should I bathe in that blood fountain?” make sure the risk is worth the reward. 20 temporary hit points are a big reward, but a level of exhaustion is just as, if not more crippling. If the 20 temporary hit points were put against instant death, the characters might be shocked to see the first PC die, but the rest will have a very easy choice in front of them and choose not to bathe. That’s fine if you play in a game where the risk of random, instant death is enjoyed by the players and aren’t looking for them to struggle with whether or not they should try the hazard for themselves. Who doesn’t love a good random table? You can assign a random effect for a hazard, make some naughty, some nice and then let the dice decide. For harmful effects, you may still want to assign a save, so a characters isn’t automatically turned petrified for rolling around in magic mud that gave a companion the benefit of stoneskin spell. The characters enter a room with an altar to a goddess of chaos. Creatures who touch the altar are subject to an effect randomly chosen on the Chaos Altar Effects table. Once a creature interacts with the altar, it cannot be subject to another effect from the altar for 24 hours. The stone altar has AC 17, 27 hit points, and is immune to poison and psychic damage. If the altar is destroyed, any effects it created immediately end. 1 The creature must make a DC 15 Constitution saving throw. On a failure it is blinded for 4 hours. On a success it is deafened for 4 hours. 2 The creature must make a DC 15 Wisdom saving throw. On a failure it suffers a random form of long-term madness. On a success it suffers a random form of short-term madness. 3 The creature must make a DC 15 Dexterity saving throw as a bolt of lightning flies out of the altar toward it. 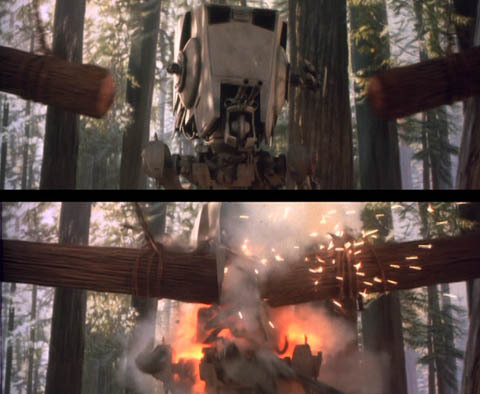 On a failure it takes 28 (8d6) lightning damage. On a success it takes only half damage. 4 The creature can see invisible creatures and objects for 4 hours. 5 The creature gains a burrow speed of 20 feet for 1 hour. If the creature already has a burrow speed, it is increased by 20 feet for the same duration. 6 The creature gains the benefit of the stoneskin spell for 1 hour. In the specific case of this altar, you might decide that appeasing the chaos goddess is more likely to give a person a better result. In that case you could add: Creatures who pray to the goddess before touching the altar are given two different effects at random and pick one effect. Just like with a binary effect, balance is important here if you want the players to struggle with the choice of interacting with the hazard but you have a more ways to achieve that balance. First you can simply have tempting rewards that seem worthy of the risks, just like you would with a binary choice. Another option is to increase the number of variables, making it impossible for players to determine what they’ll get through trial and error. Don’t feel like you need to put 100 options on a table. Charts with 10 or more options achieve this with flying colors for most groups. The final option would be to have a table with more instances of one type of consequence with less impactful effects and less of the other type with more impactful effects. Sure four out of six of the options are bad, but the other two are really tempting, or vice versa. Maybe there can be too much of a good thing. Certain effects can punish players for their greed. The first taste of meal can be delicious and healing, but beyond that first bite, there are consequences. The characters enter come across a 20-foot radius lake as they make their way through the Nine Hells. The first time a creature drinks from the water in the pool as an action, it regains 15 hit points. Devils receive the same effect on subsequent drinks from the pool. Other creatures that take subsequent drinks from the pool must make a DC 15 Constitution saving throw. Creatures who fail take 22 (4d10) poison damage and are poisoned for 1 hour. Creatures who succeed take half damage and are not poisoned. This type of hazard should be used sparingly since it will seem like an unfair trick to some players. Make sure there’s some clue that there could be harmful effects from whatever it is the characters are near. The example above takes place in the Nine Hells, which should be enough of a warning sign in itself to not drink the water. If you’re characters aren’t in the Nine Hells, a dead body, a mind-controlled (or out-of-control) creature, or a petrified creature nearby is a good way to give characters a warning of what’s to come. They just have to pick up on it! A hazard could have magic effects that only benefit or harm certain races, classes, alignments, etc. Maybe the wizard who crafted a potion of invulnerability really hates sorcerers, so for that class it functions as a potion of poison. Maybe a dragon created a special incense that when inhaled enhances breath weapon of dragon and dragonborn, but rapidly ages any other creature. The characters come across a closet-sized room in an orc stronghold that has walls covered in Orc runes that spell out prayers to Gruumsh. A creature that is not an elf that enters and reads the prayers aloud gains a +5 bonus to melee weapon damage rolls for 1 hour. An elf who does this make a DC 15 Wisdom saving throw, taking 22 (4d10) damage and becoming blinded for 1 hour on a failure, or taking only half damage on a success. You could also make this effect much narrower if you say only orcs and half-orcs get the beneficial effects and everyone else is subject to the terrible effect. Again, use these sparingly, and make sure you change-up which characters get punished when you do use such a method. 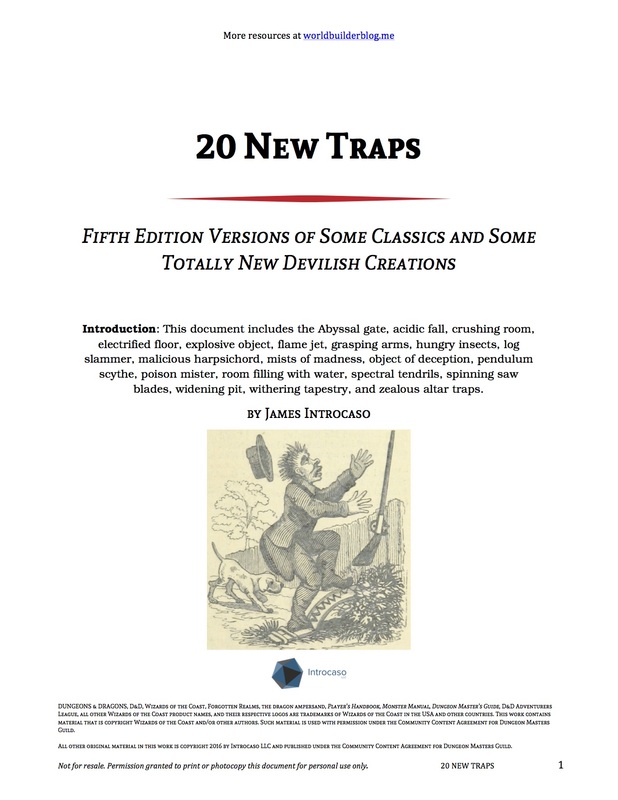 I am pleased to present my fifth Pay What You Want DMs Guild product, 20 New Traps. These traps were first published on this very blog. I’ve edited and updated them, reformatted them to make them extra pretty, and thrown in a few pieces of public domain art. Check it out! My reason for creating these new ready-to-go traps? There aren’t that many in the DMG! Check it out for free to get new traps like the Abyssal gate, malicious harpsichord, withering tapestry, and zealous altar. Plus there’s some updated classic traps like the crushing room, flame jet, pendulum scythe, and room filling with water. While you’re checking it out, feel free to also grab my other Pay What You Want products. Archons, Catastrophic Dragons, and Greater & Elder Elementals all update Dungeons and Dragons monsters of previous edition for fifth edition rules while 15 New Backgrounds gives you a bunch of new backgrounds as the title suggests plus a module for group backgrounds the whole party can share and a handful of new equipment including bombs! Take a look and please feel free to download for free. This is material I pledged when I created would always be available for free and I plan to stick to that promise. I’m always open to feedback, so leave me a comment, start a discussion on a product page, or leave me a review. Honestly at this point in my RPG career a free download with a good review is worth far more to me than cash. As I mentioned last week this blog is going to get after some hex crawl advice. Don’t worry! That’s coming. On Thursday get ready for my advice about running a hex crawl and next week we’ll talk about crafting random encounter tables.